The Budget speech commenced with an explanation that the UK’s economic growth is confounding the experts and employment is at a record high. The Chancellor however continued to tighten the country’s belt as we prepare for Britain’s new global future. The tax burden for business owners and the self-employed has increased, with the latter being a clear breach of the Conservative Manifesto from 2015 when no increases to tax or National Insurance were promised. There wasn’t much said about pensions and tax relief on contributions remains unchanged, which is good news for higher rate tax payers. 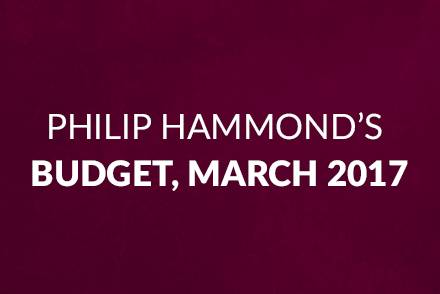 However, the Chancellor confirmed a change to an element of the pension legislation small print which could catch some people unawares in years to come. For those who have accessed their pension fund using the latest ‘Pension Freedom’ rules – where you can cash in your entire pension should you wish to do so – doing so triggered what is known as the Money Purchase Annual Allowance (MPAA). Exactly when the MPAA is triggered is fairly complex but, to date, if you were subject to the MPAA you could only contribute £10,000 per annum into your pension in future. The rule was designed to prevent people recycling their tax-free lump sum which does make sense. Whilst no evidence has been published to support their stance, the Government have said that people were taking advantage of the opportunity to recycle their lump sum and therefore the MPAA is reducing from £10,000 to £4,000 with effect from 6th April 2017. For those in retirement, this change will not make any significant difference. However, for those still working and potentially still members of their employer’s pension scheme, restricting future contributions to £4,000 per annum could be problematic. The rules surrounding pension withdrawals and the money purchase annual allowance are complex and not all ‘income drawdown’ policies will be subject to the new rules because older style ‘capped drawdown’ arrangements are exempt. Naturally, we can help you understand how this change will affect you. The Chancellor also announced a new 25% tax charge on any pension transfer to an overseas arrangement, unless the saver is living in that country. This is in response to the increasing number of pension scams using this route. Self-employed earners’ National Insurance contributions, technically known as Class 4, and payable on profits between £8,060 and £43,000 is rising from 9% to 10% in April 2018, and again to 11% in April 2019. The unflattering headlines on yesterday’s papers indicate that this increase is not very popular reflecting the increasing number of self-employed individuals working throughout the country. For individuals with a share portfolio or who run their own incorporated business, the recently introduced £5,000 dividend allowance is being reduced to £2,000 from April 2018. It is worth noting though that the steady increase in the tax-free personal allowance, which rises to £11,500 next month, helps offset both of these changes and it seems to me that what the government is giving with one hand, they are simply taking away with the other. Finally, the higher rate income tax threshold is rising from £43,000 to £45,000, again with effect from April this year. The Chancellor confirmed the launch of a new savings bond from National Savings & Investments. This will offer an interest rate of 2.2% but is limited to deposits of up to £3,000. The interest will be taxable but, depending upon individual circumstances, could fall within the Personal Savings Allowance (PSA). The PSA allows basic rate taxpayers to add up to £1,000 in savings income tax free, with higher rate taxpayers able to add up to £500. Additional rate taxpayers are not entitled to a PSA. The Chancellor confirmed that corporation tax is reducing to 17% from 2020, again this seems to offset the changes to dividend taxation for small business owners. Business Rates have been subject to a lot of discussion recently with many firms facing significant increases following a change to how rates are calculated. A number of relatively minor changes were announced but it would have been better in our opinion if a full review of the concept of Business Rates had been announced. Quite what relevance the value of your premises has on the tax you pay remains a mystery to us. It would seem logical for the tax to be based on turnover or profit, but common sense does not always apply. Social care funding faces enormous challenges and a £2 billion grant to fund local authorities over the next three years was put in place, with £1 billion available this year. A Green Paper will be published in the summer exploring all of the options available. A new minimum duty on cigarettes was introduced and there were no further increases to alcohol or tobacco duties. Hauliers and HGV Road User levies have been frozen and there were announcements for additional investment for infrastructure in the North and Midlands, new technology such as driverless cars and next-generation mobile phones. Finally, the ‘sugar tax’ appears to be working as revenue generated was less than anticipated.